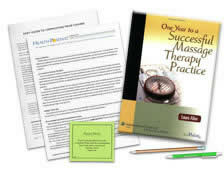 Do you have the One Year to a Successful Massage Therapy Practice textbook? See your enrollment options above for "I already own the text". Energize your practice and take it to a new level by following the suggestions in this course based on Laura Allen’s book One Year to a Successful Massage Therapy Practice. In addition to giving you 8 CE hours toward your state and/or national renewal, the textbook includes Bonus journal space to help you generate ideas; apply them to our situation, and track your progress. I am already starting to use the information to market. Cant wait to see how the next year turns out! This is a valuable resource for massage therapists - and even those who may own small businesses in other fields as well. The textbook author lays out the foundation of what good business planning entails, and gives very detailed and thoughtful advice about various marketing strategies - from the simple (brochures, flyers, etc.) to the more complex (hosting a health fair, using radio time, creative promotions, etc.)... most of her ideas are very affordable and approachable for the average massage therapist - I got some great ideas! Wonderful resource book with inspiring practical tasks. Very helpful course....I am sharing info with many of my fellow therapists! The text offered a lot of helpful information in an organized way. I loved how it broke everything down into smaller steps so the "starting your own business" goal doesn't seem so overwhelming. This was an excellent book! This course was very eye opening for me and made me realize a lot about myself. I have put in place a lot of the strategies and have gained 2 new clients in 1 week. Looking forward to continuing with these strategies and increasing my business. I liked the parts with the personal experiences and examples of what other therapists find useful. It was a great course. I have been a massage therapist for 15 years and felt I was already familiar with much of the information presented, however the idea for a massage grant was MORE than worth the time and money I spent on this course! The course also gave me a new found enthusiasm for taking my business to the next level! Thank you! Great book with new prospective in advertising. I am starting my own practice and Laura's advice was very helpful. I feel much more confident after having read her book! I truly enjoyed this course. I have been licensed for a while but business isn't where I wish it to be thanks to a lack of know how and lack of extra funds, however this course has given many ways to exceed without deleting all my funds. THANK YOU! In most open book tests the wording in the text is word-for-word the same as the wording in the questions. Since the words were not verbatim, I was not 100% sure about some of the answers, which was fine. I was forced to rely on my common sense. All-in-all this course has inspired me to market my services in ways I have never considered. I am excited to make my business a success. I recommend this course to all massage therapist, new and season practitioners. An excellent review and refresh ideas. Enjoyed taking this course. Will be able to use the information for my practice. Wonderful course! I've been a massage therapist for many years and learned a lot! Define your business goals and establish a marketing budget and calendar. Identify effective ways to make your business stand out through print; internet; radio; TV; phone; health fairs; seminars; marketing partnerships; marketing to special populations; referral relationships and/or other venues. Identify resources for collegial support; marketing education; research; grants, and publishing.